Grouse Ridge off Bowman Lake Road off Highway 20/80 on the way to Donner Pass. You can start you hike at the fire lookout on Grouse Ridge, and hike down to about ten different lakes, all within about a five mile hike. So you could easily hike around there for a few days, and the good news is that when you hike back UP to the fire lookout, your packs are empty and will weigh a lot less. Carson Pass has some nice destinations as well. You could easily hike to Meiss Meadow, Showers Lake, Round Lake and Dardanelles....and if you have two cars, you could even make this a bit of a through-hike to Echo Summit along the Pacific Crest Trail. South of Carson Pass are a couple of nice lakes as well--Winnemucca and Round Top. They are within 2 miles of the trailhead, and about 2 miles from each other. So you could hike as slowly as you like and still arrive with lots of time left over. Some of the initial trail out of Woods Lake is steep, but just take it nice and slow. I saw the suggestions about Emigrant Wilderness. We've done quite a few hikes there. Lost and Sword Lakes (in Carson-Iceberg Wilderness, north of Highway 108) might work...only five miles. But you might have lots of younger company there, and those young folks might want to party a bit. We went when there was still snow on the ground in early June, and had the place to ourselves. That's the view from Lost Lake below left. You could also work out a trip from Crabtree Trailhead (behind Dodge Ridge) to Grouse Lake and the Chain Lakes, but the camping at Grouse Lake isn't great---it gets lots of horse traffic. Camp Lake, in that same area, is lovely, and you could continue on to Bear Lake from there. If you keep heading south on 395, look at Little Lakes Valley--that's it at left, from the trail up to M9ono Pass--a perfect spot for what you're looking to do. And if you feel up to it, you can hike over Piute Pass and spend days exploring Humphreys Basin...but the first day would be a long hike up and over the 11,000+ foot pass---about six miles or so? And Duck Lake and beyond out of Mammoth would work---but you'll see a lot more people there. On the West side again, you should check out Dinkey Lakes---lots of lake with easy access within 2-5 miles of the trailhead, and you could make some easy loops here. 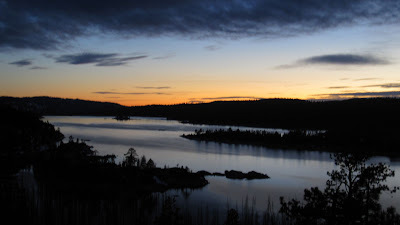 Finally, back up above Bass Lake, take Beasore Rode out to Chiquito Trailhead and hike to Chain lakes, or Fernandez Trailhead and hike up the string of lakes to Vandeberg Lake and beyond. Hope that gives you enough to think about! This was a fun exercise---and I hope you don't mind if we post this on our website at some point for people who are looking for a way to go backpacking with limited time or physical resources. Remember that these trails and destinations, in most cases, will be more crowded than some of the spots you've enjoyed in the past, exactly because they are more accessible. But that still doesn't keep them from being beautiful.